The 2015 AIDA Individual Depth World Championships have now closed and this year were hosted in Limassol, Cyprus from 11 – 19 September, on a spectacular 500m2 barge, with up to 40m visibility. A team of 8 British athletes represented the country: Liv Philip, Georgina Miller, Helena Boudillon and Beci Ryan for the women and Michael Board, Tim Money, John Moorcroft, George Close for the men. Michael Board came to the competition with 2 Wild Cards one in constant weight (CWT) and the other in free immersion (FIM), meaning he ranked Top Ten in the World last year (in those disciplines). All the athletes are self-funded and were grateful to receive sponsorship from Elios, Divesangha and Bounce Energy Balls. Strong currents and changeable weather effected this year’s World Championship competition. Because the currents had a tendency to build in the afternoon, the deepest athletes competed first, which meant extremely early starts and a change in routine (at short notice) for these elite contenders – this was reflected in conservative announcements and a high level of disqualification for some. But of course the sea is the sea and not known for being tamed so all the athletes had to adapt their performances and announcements and it made for an interesting and not at all predictable competition. There were three competition days, one for each of the competitive depth disciplines: constant weight no fins (CNF), constant weight (CWT) and free immersion (FIM). Day one was CNF. Sayuri Kinoshita (JPN) and Mandy Sumner (USA) shared gold for the women with dives of 58m, Estrella Navarro (MEX) took silver with 50m and Jennifer Wendland (GER) won bronze and a national record with 46m. Alexey Molchanov (RUS) won gold for the men with a dive of 85m, Mateusz Malina (POL) and Miguel Lozano (ESP) shared silver with dives of 76m and Stig Prys (DEN) took bronze with a 75m dive. The UK’s John Moorcroft came in 8th for the men with a strong clean dive of 64m. Day two was dedicated to CWT. Misuzu Okamoto (JPN) swam down to 90m for gold; Sayuri Kinoshita (JPN) won silver with 88m and Natalia Zharkova (UKR) bronze with 87m. Liv Philip placed 11th with 64m, Helena Bourdillon 13th with 60m and Georgina Miller came 15th with dive to 51m. Alexey Molchanov won his second gold with a dive to 122m for the men, Samo Jeranko (SLO) and Goran Colak (CRO) shared silver with dives to 108m and George Panaglotakis (GRE) won bronze with 103m. Tim Money came in 16th with a dive to 68m and newcomer George Close swam a comfortable 50m dive at his first World Championships. The third and final competition day was for FIM. Jeanine Grasmeijer (NED) won gold with an 82m dive, Kate Middleton (NZL) and Hanako Hirose (JPN) shared silver with 76m dives and Natalia Zharkova bronze with 70m. Liv Philip came in 4th with 68m and Helena Bourdillon 7th with 57m. For the men William Trubridge (NZL) took gold with a dive to 112m, Miguel Lozano silver with 107m and Mateusz Malina bronze with 103m. Tim Money came 13th with a dive to 62m and Michael Board had set a new UK national FIM record in the pre-comp event of 97m. There are two World Championships set for 2016: the AIDA Individual Pool World Championships in Finland and the AIDA Team World Championships (which combines pool and depth: static, dynamic and constant weight). On Thursday 10 September Michael Board broke his own Free Immersion national record by pulling himself down a rope to a depth of 97m and back again. Michael was taking part in the Pre-Competition to the Individual AIDA Depth World Championships in Limassol, Cyprus and it was the third and final day of the competition. Board had previously nailed a solid 100m Constant Weight dive, using a mono fin to swim down and up, on day one and so was looking in good shape to dive deep in this competition, and as it turns out started and ended on a high note. Mike’s previous record was 96m, set at the prestigious Vertical Blue competition on Long Island in the Bahamas on 15 November 2013. Wednesday 9th December 2014; — On the 2nd December, at the prestigious Suunto Vertical Blue competition, Michael Board pushed his national record in Constant Weight deeper still, from 102m to 103m; at this kind of depth, each meter is like a milestone. Michael lives in Indonesia, on the island of Gili Trawangan, where he teaches freediving courses and training at his, and partner Kate Middleton’s school Freedive Gili (www.freedivegili.com). Board came an impressive 4th at the end of the competition, with a Free Immersion (FIM) dive to 95m and a Constant No Fins (CNF) dive to 56m. Also at the competition were top British Freedivers with some impressive results: Chris Crawshaw, also of Freedive Gili who placed 8th (75m CWT, 70m FIM, 68m CNF) and John Moorcroft of Apneists UK who placed 10th (71m CWT, 63m CNF). Sunday 12 October 2014; — From the 16th to 27th September, the ninth AIDA Team World Championships took place in the Gulf of Cagliari, on the island of Sardinia, organised by Blue World Apnea School (www.blueworldchamp.it). This year the UK was represented by a team of 3 men and 3 women: Georgina Miller, Liv Philip, Beci Ryan, Mike Board, Tim Money and Adam Drzazga. Jay Cluskey acted as a fantastically organized and supportive coach to all the athletes; attending the daily Event Committee meetings, keeping everyone up to date with competition news and ensuring people had what they needed throughout. The team had fantastic sponsors in the form of Elios Sub (www.eliossub.com), Prawno Apparel (www.prawnoapparel.co.uk), Beet-it (www.beet-it.com), and Bounce Energy Balls (www.bouncefoods.com). Team events takes place every other year (alternating with the individual events), and as one of the UK team put it this year, the team event is a very different kind of beast! Being a member of the team requires thought and work both before and during the event – tactics and intentions need to be discussed openly and honestly, for example are individuals aiming for personal bests (therefore increasing the risks of a yellow or red card), or are they open about working together, setting aside their own goals and potentially pulling back their performances in the hope of gaining a place on the podium? Because of rough weather at sea, the competition started with Static (STA). Ordinarily Constant Weight (CWT) is the first event, followed by STA and ending with Dynamic (DYN). The change in order put everyone on their toes, the athletes because they thought they had plenty of time to practice STA in between the other disciplines and the Organiser because it was uncertain when the CWT would fit in, if at all. On the evening before the announcements for STA, the team sat down together. Each person was given a chance to talk about their expectations and aspirations of the event; by the end it was agreed that athletes be given the freedom to go out and do own best performance under their own judgment. The idea was to then reconvene after the first performance day had finished and re-evaluate the situation accordingly. It was a real mixed day for both UK teams as everyone did valiant performances, with some huge holds. Michael Board held his breath for 07:01, Tim Money for 05:55 and Liv Philip and Beci Ryan did competition personal bests (PB) of 06:05 and 04:58 respectively. Georgina Miller did a massive hold of 06:30, however the surface protocol (SP) stood in her way for a very minor error. Adam Drzazga did a brave hold of 07:15 but he too lost out to the SP. I think it’s important to say that both athletes had the full support of their teams for their fantastic efforts. There is a silver lining in receiving a red card for the teams, in that it allows athletes the option of going all out for personal glory for the rest of the competition. The Brits were not the only team to receive red cards, five other countries also got them – the Italian team got two, both in women’s team for the touch rule (it is forbidden for an athlete to be touched by anyone upon surfacing), which is especially bitter as both athletes did clean performances and nothing wrong, it’s rather like the home goal rule in football. Next up was CWT and the competition day saw near perfect conditions in the beautiful blue waters of Sardinia. The harbour, a short walk from the hotel, had a host of speedboats scheduled to ferry the athletes to and from the dive site where two competition lines were setup to ensure a slick and speedy day of diving. The competition started with the deepest divers and ended with the shallowest and second up to dive that morning was Michael Board who went down to 95m; Tim Money did a solid swim to 61m and Adam went to 55m and came back with a PB. Liv swam an impressive 70m, another PB for her in the competition, Georgina swam with ease to 50m and Beci to 40m. Everyone received white cards and there were smiles all round. The third and final competition day was reserved for DYN. This is always an exciting discipline to end on and is often when the goal posts for podium places change, this World Championships was no different. Usually if a team receives a red card at any point in the competition they forfeit the chance of a medal, yet the Russian Men’s team proved an exception to the rule by taking home gold! The UK men’s team put in fantastic efforts with Michael pulling out a big 201m swim, Tim Money a PB of 176m and Adam Drzazga 175m, which is a long way to swim and a lot of turns in a 25m pool! Georgina Miller swam a comfortable and easy 126m, but both Liv and Beci were not so lucky and got red cards. Beci Ryan received her first red card in competition, she swam 168m, which is a big distance, but failed with her recovery breathing upon surfacing. Overall everyone walked away deservedly pleased with their performances. New boundaries were discovered, lessons learned and training and freediving relationships cemented. Competition season is not over yet for this year, in fact we are pleased to announce that there are two pool competitions happening in the UK next month: the Apnea Revolution Cup BFA Pool competition (www.apnearevolution.com), in London on Saturday 1st November and the 3rd BFA Madchester Classic (www.freedivingcompetition.com), in Stockport on Saturday 29th. Both competitions have benefited from the BFA’s newly introduced Pool Grant aimed at promoting freediving in the UK. 10 Sept 2014; — Liv Philip wins the 2014 Freediving Cup Circuit and AIDA Euro Cup! Liv Philip has done it again and taken first place at the AIDA Euro Cup in Kalamata, with strong, confident dives across all the competition depth disciplines and even managing to pop in a personal best at the end with a big Constant Weight (CWT) swim of 67m, showing that Liv has not yet reached her limit. For those who are not familiar with the freediving depth disciplines, CWT is when a freediver swims down a rope, to a pre-agreed depth with the use of a monofin, without pulling on the rope and without changing weight. British athletes Georgina Miller and Michael Board took second place on the podium for the women and men. George competed in all of the depth disciplines, even putting in a competition personal best to 51m in CWT. Mike Board is on form with dives in the 90’s in CWT, one to an impressive 95m. With the World Championships in Sardinia a mere week away, and Liv, Mike and Georgina making up half of the team, these are exciting times for the British athletes! 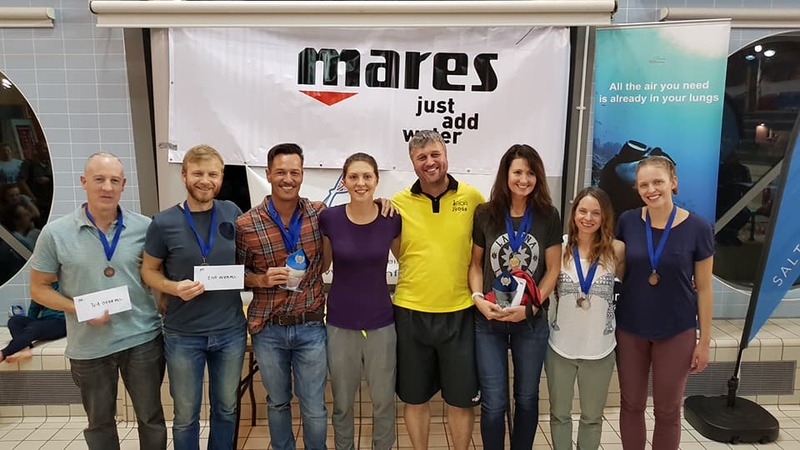 Earlier this month Michael Board competed at the annual Vertical Blue (VB) competition held at Dean’s Blue hole in the Bahamas, where he became the first Briton to dive, in competition, to over a 100 meters in the discipline of constant weight (CWT). The VB is extremely popular worldwide with freediving athletes and always attracts those at the very top of their game. The attraction of this competition is not just down to its stunning setting, but also because of the meticulous organisation, brilliant safety divers and experienced AIDA judges. From the start there was a huge amount of pressure on Mike’s shoulders from both himself and other people. All eyes were on him to see if he could make it down to that golden 100 meter mark. All he had to do was swim down vertically, the length of the marked rope, with the aid of his monofin, pick up a tag attached to the bottom plate, and swim back, complete his surface protocol and hey presto, National Record. But of course it is not that simple and a CWT dive to 100 meters is no mean feat. For a start, the dive is done on one breath, lasting approximately 3 minutes; add to that the huge exertion of pressure on the body which builds at depth and the water temperature which gets colder through the thermo cline and then the fading light into darkness. Experience is vital and key. Being an experienced diver, Mike planned his dives over the next few days with thought and care. His second dive in Free Immersion (FIM) was to a deliberately low (for him), 91 meters. This ensured a relatively easy dive where he felt relaxed and strong, giving him confidence going in to the next 100 meter attempt. There was the added bonus of setting a new National Record in the discipline, adding 8 meters onto his previous record of 83 meters back in 2011. Nick Mevoli lost his life at the end of a competition dive on the 17th November at the Vertical Blue. Nick, an America freediver, was a silver medallist at the 2013 World Championships and Constant Weight National Record holder; he was well known and loved by many of his fellow athletes. The cause of his death is under investigation. Monday 10th December 2012; — Mike Board has officially claimed his place as Britain’s deepest man; at the Vertical Blue competition last month he pushed the men’s Constant Weight record of 91m to 92m, 94m and finally 96m. He attempted 100m to become the first Brit to officially cross the line, but despite being conscious on the surface was disqualified for forgetting to remove his noseclip. 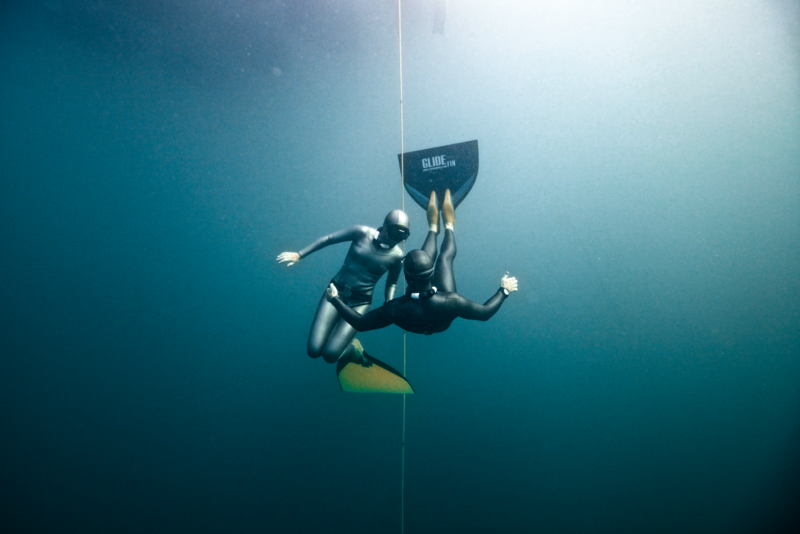 Mike had already made his mark on British freediving with two National Records in the discipline of Free Immersion (pulling himself down and up a submerged, weighted rope) to a maximum depth of 83m. These records, and his closest of misses at the 100m, really solidify Mike’s reputation as an outstanding freediver. The competition got off to a wobbly start as nerves got the better of Mike in this, his first, attempt at the lauded CWT title. On 20th November Mike turned early at 88m on his first attempt at 92m, however two days later managed to pull the record out of the bag with a dive to 92m in two minutes and 50 seconds. With the record secured, the pressure was off, and things began to get very exciting for the British freediving instructor and owner of freediving school, Freedive Gili in Indonesia. On 26th November, Mike did a far more comfortable dive to 94m one second faster than his previous record, and on 28th he hit an incredible 96m the same depth as fellow Briton Sara Campbell’s former World Record in two minutes 51 seconds. Buoyed by his success Mike decided to take a risk on his final dive and attempt the magic 100m. To all intents and purposes it was a clean, successful dive, however the protocol of competition requires that a diver removes all facial equipment before giving the ‘OK’ sign to the judges. Mike forgot to remove his noseclip, thereby disqualifying this attempt as an official British record. Mike said: After having narrowly missed the National Record at the Worlds in Kalamata last year I set my sights on Vertical Blue to really test my ‘depth legs’. Equalisation looked like being my main barrier to achieving it, but with a few tweaks, which clearly worked, any by increasing the speed of my dives to reduce my hypoxia at the end of the dives, I not only stole the record from Dave King, but I broke my own record twice over! The Worlds are being held again in Kalamata next year and you can put money on me attempting the 100m once more officially then! For now it’s back to work in Gili, and training whenever I can find the time and depth. Liv Philip, one of the UK’s top female divers, was also at Vertical Blue, and came third in the No Fins category with a dive to 50m, and an excellent fourth place overall after a very tough and tight battle with Japan’s Tomoko Fukuda.